Steel pan was little known outside Trinidad, the island-nation of its invention, in the early 60’s when Rupert Sterling, an exchange student from the Caribbean island of Antigua, arrived in NYC to study engineering. Rupert soon found himself teaching pan to street gangs on the notorious Lower East Side of Manhattan, under the direction of social worker Murray Narell. The music was raw and dynamic and soon the teens were channeling their energy into a cooperative musical experience instead of street violence. The enthusiasm was contagious and soon Murray’s adolescent sons, Jeff and Andy, were playing along. 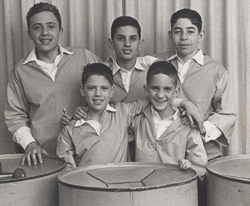 The Narell brothers absorbed steel band arrangements of 60’s calypsos and then expanded their repertoire to include classics, rock and roll, Broadway show and pop tunes. They began to perform with some neighborhood friends as The Steel Bandits, and created a stir as a novelty act. Over the next seven years, they appeared on national TV shows, major concert venues, recorded an LP, and were invited as guest artists to Port of Spain Trinidad’s National Music Festival. In 1967, Murray arranged for Ellie Mannette, the father of the modern steel pan, to come to NY to spread the artform in America. The band benefited from the master’s presence and his state of the art instruments. In the early 70s Jeff relocated to the San Francisco Bay Area, being the first, along with his brother Andy, to bring steel pan to West Coast audiences. Jeff began working with youth groups to pass on the legacy, and co-founded the early crossover band, Salsa de Berkeley, bringing pan to the streets and into the clubs of the Bay Area. He has been a presence on the world music scene ever since, leading a succession of Caribbean flavored bands working the West Coast and Hawaii, and establishing himself as a player and bandleader, “in the forefront of the cross breed movement blending jazz, calypso, latin, pop and reggae” (Robert Weider, San Francisco Chronicle). Jeff’s ensembles have performed at thousands of venues: clubs, music festivals, corporate events, multi-cultural programs, celebrity weddings and Lake Tahoe casinos. Along the way, he has released three CDs of original compositions. With great respect for Trinidad culture and the musical pioneers, Jeff has had the pleasure of performing with Calypsonians Crazy, Chalkdust and Shadow, and with pan greats Boogsie Sharpe, Robbie Greenidge, Ray Holman and Professor Philmore in concerts both in the States and in Trinidad. In the 80’s Jeff and Ellie Mannette rekindled their connection and have conducted workshops across the country including Ellie’s annual summer “Festival of Steel” in Morgantown, WV. In 2004 Narell was invited by Dr. Mannette to premiere the latest addition to the steel pan family of instruments, the extended lead Circle of Fifths pan. Steel Bandits – Jeff is center back row. 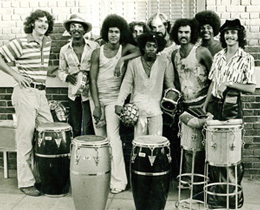 Salsa de Berkeley – Jeff is third from right. 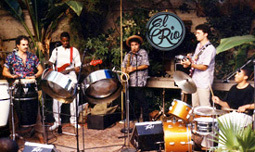 Rhythm & Steel Band live at El Rio in San Francisco.